St. Mary’s Hospital is on the right. At the time, this stretch was a right-of-way and is now the site of a modern residential development on the west side of Yale Avenue. The landmark hospital smokestack on the right can still be seen behind the new homes if you’re on Yale. Slight correction: I live very close to where the picture was taken. If that trolley is headed toward Wise Avenue, then it’s southbound. Thanks so much for posting this picture by the way! We were so excited to actually get a look at this streetcar. We had heard a lot about it. The smokestack is no longer there, they took it down earlier this year and replaced it with an ugly shorter steel one.I live directly across Yale on the east side. My father was a motorman on this line and I rode with him many times. On his day off he would take me and my brother riding from our home near Hodiamont and Kennerly on the City Limits line in the other direction to Ferguson. 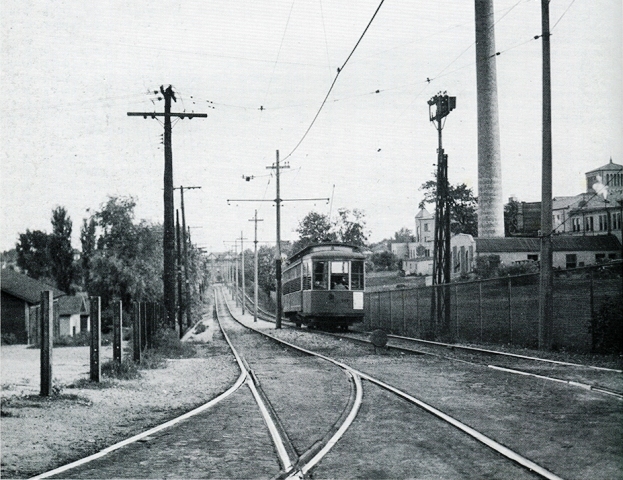 The rail curving on the left side of the photo served the Forest Park streetcar line which ran east on a right-of-way on the north side of Oakland Boulevard. There was a short-line loop at Tamm Avenue for streetcars which did not travel all the way to the Forest Park streetcar loop shared with the Brentwood Line just north of Dale Avenue at Lindberg Drive (not to be confused with Lindbergh Road). That whole area as crawling with streetcar lines, much of the rail traveling through wooded areas rather than streets. What a different world it was and I remember it all so clearly. I think your photo shows a westbound streetcar on wise. The track veering to the left in the foreground is going south on Yale, or future Yale. The building on the right with the Spanish-Moorish cupola is a religious building behind St. Mary’s Hospital. If I could add a few contemporary photos of this area I would, to support my thesis.